Griffin provides dewatering and water treatment solution during construction of the Pearl Place Google Office Campus, requiring water drawdown to 30 feet (ft.). The pearl place site was 380 ft. x 240 ft. and required a three (3) level underground parking facility, extending to 30 ft. below existing grade. The soil is comprised of cobbles and boulders and bedrock is approximately 20 ft. below grade. The site is adjacent to Dry Gulch, which has fluctuations in water levels and quality throughout the year. The groundwater at the site was high in Total Suspended Solids (TSS), Arsenic, Heavy Metals, and high levels of Selenium, Chlorobenzene and Iron and Manganese and a permanent water treatment system would be necessary to discharge from the site. Griffin developed a dewatering plan for the deep excavation which extended 30 ft. below grade. Griffin installed 400 wellpoints on 3 ft. centers around the excavation. The wellpoints were drilled to bedrock. Once the water table was drawn down as much as possible, Griffin provided sumps to remove the perched water at the bedrock interface. 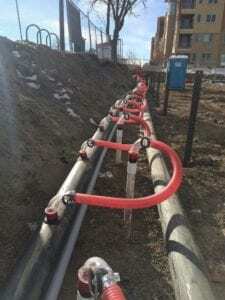 Four pumps with 500 ft. of header pipe per pump were necessary to maintain a high vacuum due to the project elevation of approximately 5,300 ft. The water treatment system was completely automated to accommodate variations in incoming water flow and quality. There was also minimal room in the finished building to fit the permanent treatment system. Griffin developed a system that was completely automated and fit in the space provided, which continues to treat the contaminants found on-site today. Griffin successfully developed the multi-step dewatering solution, and permanent water treatment solution, to solve the client’s needs for temporary groundwater control and permanent groundwater treatment to meet the stringent city discharge requirements. Griffin’s equipment was configured to work with the geological and topographical limitations onsite and is intuitively designed for optimal performance.